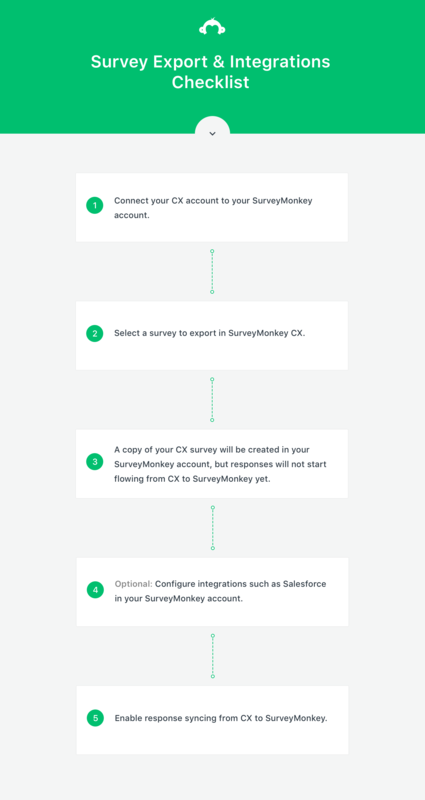 If you plan to use a 3rd party integration with your SurveyMonkey CX account, like Salesforce, read on to understand how the CX survey export feature works. The 3rd party integration will only sync responses that are collected after the setup of the integration. Note: the sync to SurveyMonkey core is only available on some plans. Reach out to your CSM or to cxsupport@surveymonkey.com to see if it's available for you. Click Connect SurveyMonkey and authorize the connection. If you have already connected a SurveyMonkey account to CX, you will need to disconnect and reconnect it. Go to your core SurveyMonkey account. You should see the exported survey under the My Surveys page. Reach out to your CSM for specific steps regarding your particular integration. Click Start Exporting Responses. Approximately one response will sync per second. You can pause the syncing if desired. Refresh the page to see the syncing progress. Go to your core SurveyMonkey account. You should see responses in the My Surveys page, and on the Audit Log for some integrations.